For Stephen Granade's adventure game website, see Brass Lantern. Among the first inventory items acquired by players of Zork I in their quest was an old battery-powered brass lantern. It proved to be among the most critical objects in the game, for it was the PC's most trusted light source, the key to several of the game's puzzles, and sometimes the only protection from the deadly adventurer-eating grues. 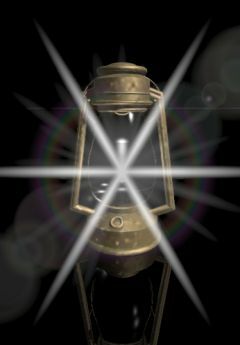 Similar lanterns were featured in almost every subsequent Zork game, and the brass lantern has since become an icon of interactive fiction. Although Zork described it only as "a battery-powered brass lantern," it is almost universally depicted as a storm lamp of the type shown here. The lantern almost invariably features as part of a light puzzle of the light-darkened-areas type. The lantern may require a power source, generally either a battery or lamp oil. Often these will not be found together with the lantern. For oil or paraffin, matches may also be necessary. Candle lanterns also make occasional appearances. Some games will put a time limit on how long the lantern will stay lit, and require occasional refuelling. The lantern is often vulnerable. Wind may blow it out (despite the storm cover), or it may gutter. It is obviously not a great idea to try and use it underwater. It may become irreparably broken if treated too roughly - for instance, if the player falls a long way. This may simply be a plot twist that cannot be avoided, or require forethought on the part of the player to avoid - lowering the lantern down on a rope before going down a rock-slide, for instance. The lantern can be a source of fire, which may be useful or dangerous. The upcoming 2008 documentary Get Lamp uses a brass lantern as an iconic symbol representing the medium of text adventures. For example, in most of the interviews, a brass lantern can be seen somewhere in the background. This page was last modified on 16 March 2007, at 03:59.